A dirt road leads to the "Kabul Golf Club," the only golf course in Afghanistan. The course was opened in 1967, but shut down when the Taliban gained power in Afghanistan's civil war. 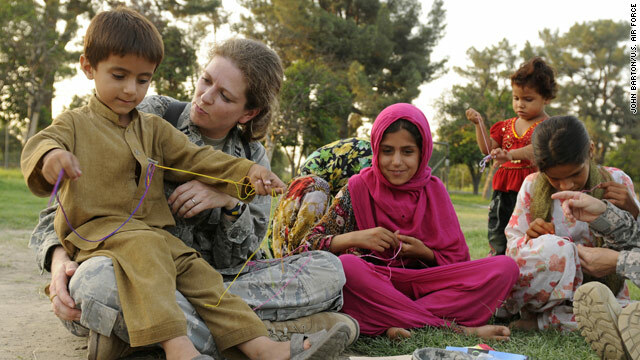 A young Afghan boy and his sisters learn to make friendship bracelets from U.S. Air Force Capt. Mary Danner-Jones during a Girl Scout meeting in Jalalabad, Afghanistan. Danner-Jones is a member of the Nangarhar Provincial Reconstruction team stationed at Forward Operating Base Finley Shields in Jalalabad, Afghanistan. Eight policemen were killed and one wounded Thursday in an insurgent attack on a police post in Kunduz province, northeast of Afghanistan, a spokesman for the provincial governor said. A group of insurgents attacked the post early in the morning, said the spokesman, Mohibullah, who only goes by one name. A tenth policeman survived the attack, he said.